Brown cafés are neighbourhood gathering spots where you can meet locals, enjoy a drink and eat a little snack. They are all over Amsterdam and usually stay open until 1 or 2 am. They are named brown café because the furniture is of dark wood and the walls are deep brown due to innumerable years of cigarette smoking patrons. The anti-smoking law of July 2008 put an end to smoking in public places. Some brown cafés have designated smoking areas which are often more congenial than de non-smoking part. 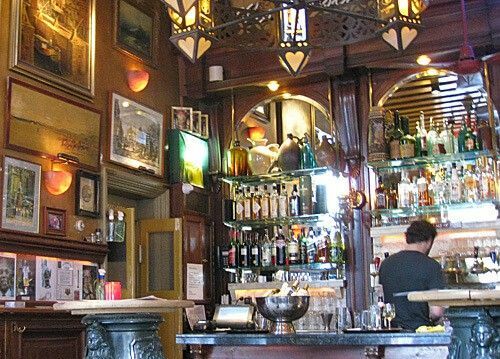 A Brown Café is where the Dutch go for a drink after work and one of the best places to meet locals. Brown Cafés serve beer, wine, jenever (Dutch gin) and finger food. Every Bruin Café has its own charm and speciality. Café Hoppe is a national monument and dates back to the seventeenth century, Café Zotte and Café Gollem are famous for Belgian beers. Spui 18-20 – Spend an evening in Café Hoppe and you are guaranteed to have a good time. This place welcomes people of all ages. Walk in and make your way to the bar an order a cold Heineken. The menu offers good options from Hoppe Burger to toasted sandwiches. This is a good opportunity to try bitterballen or beef croquette served with a slice of bread and a big dollop of mustard, a true Dutch delicacy. Raamstraat 29 – Café Zotte is a little gem in the heart of Amsterdam. Grab yourself a refreshing drink, order a snack and share with friends. 130 Belgian beers grace the drinks menu, from ales to white beer and lager. Food appears in the evening and may include succulent steak with Flemish fries and will not leave you hungry. Raamsteeg 3 – Café Gollem prides itself in having the largest beer selection in the city. And this shows; the walls are lined with old beer bottles, empty though. Take your pick from 14 taps and 200 bottled beers including Gollem’s precious IPA, La Chouffe, De Koninck and Trappist. This is an Amsterdam Bruin Café with Belgian ambience and Belgian beers.